“We believe the year ended with the overall industry achieving about a 10% attach rate of NFC solutions to the 445m smartphones shipped in 2011, albeit below our original expectations of about a 16% attach rate,” the chip maker’s CEO has told analysts during an earnings call for its end of year financial results. 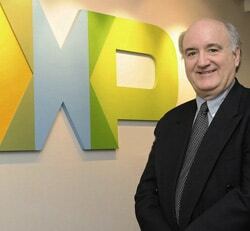 CLEMMER: "Very comfortable with our position"
Rick Clemmer, CEO of NXP, has provided details on the NFC phone market as a whole as well as NXP’s share of the NFC chip market during an earnings call with analysts to present the chip maker’s fourth quarter and full year 2011 results. “Overall 2011 was a breakout year for our mobile transactions group as revenue grew over 70% year on year,” Clemmer told analysts during the presentation of the company’s results.